The win takes Pep Guardiola's side, who lost for the first time in the league this season with a 2-0 loss at Chelsea last week, back to the top with a two-point advantage over Liverpool. It was not a vintage performance but City avoided a second straight slip-up, silencing any suggestion that they may be about to stutter in their title defence. "The players responded in a marvellous way. Everton have top players and today was tricky, a dangerous, dangerous game," said Guardiola. It is two years since City lost consecutive league games, and they have never gone successive league matches without scoring under the Spaniard. A midweek win over Hoffenheim in the Champions League should have dealt with any lingering hangover from the Stamford Bridge defeat but City started poorly on Saturday. Their passing was unusually imprecise, the movement a little disjointed and Everton, set up for a counter-attacking game, should have taken the lead in the 15th minute when Lucas Digne skinned City full-back Kyle Walker and curled in a cross from the left but Richarlison's attempted volley was off target. Seven minutes later and City showed that even when they are off-rhythm they can still punish any sloppiness. A poor clearance from Yerry Mina, Everton's Colombia defender, gifted City possession and Leroy Sane, chosen ahead of Raheem Sterling, slipped in Jesus who confidently slotted past Jordan Pickford. As so often at the Etihad the opening goal changed the match with Everton on the back foot from then on. "Until the moment they scored the game was what we expected we were blocking them and they didn't create one chance," said Everton manager Marco Silva. "The biggest chance was our chance with Richarlison. Against these teams we have to be effective when we create opportunities to score. "We made a mistake with the first goal. They scored and after that they were more comfortable," he said. Sane was the creator again when Jesus doubled City's lead five minutes after the break, with a header from a pinpoint cross by the Germany winger. Silva was clearly disappointed that, despite playing with three central defenders, Jesus was left unchallenged to convert a goal that put City in firm control. Everton showed some resilience though, fighting back with a fine header from Dominic Calvert-Lewin in the 65th but the hosts restored a two-goal cushion when substitute Sterling was left unmarked to head in a Fernandinho cross with his first touch. 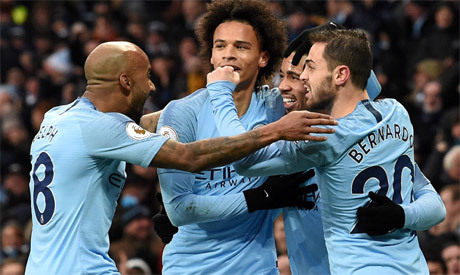 City have won their last 10 home league matches scoring a total of 36 goals and Guardiola, while aware of his team's slow start, was pleased with the reaction to the Chelsea defeat. "It was a tricky game with less than three days recovery after a Champions League game and it was in our minds we were going to suffer today and we did," added Guardiola. "The game was not over until the end. "But we have fantastic players, human beings, and they made a fantastic effort to win the game," he said.